Hooray! After more than a year I finally received my first payment from Infolinks as a publisher. At first, I put the links with one of my sites then decided to add it with my other blogs. I have observed that it generate income from my site with high traffic visitors. The payment that I received is not that big but I am so happy because this earnings will be a great help in the maintenance of my site. Currently, I am finding other ways to earn big from Infolinks and the best thing to do is to create good content. Adding Search Engine Optimization, is another way so visitors can reach your content. 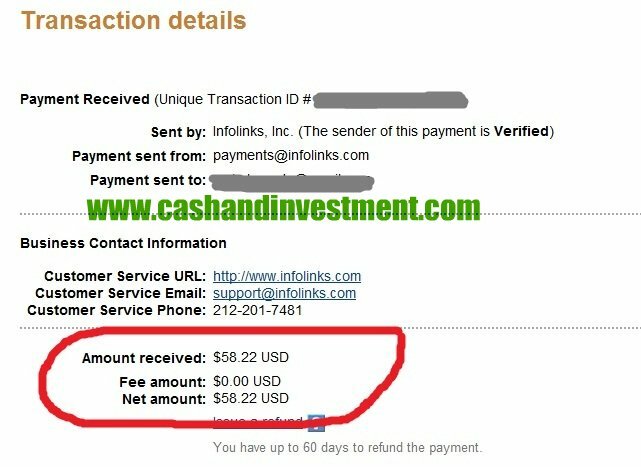 The photo below is the actual proof of earnings that was sent to my Paypal account from Infolinks. Thank you so much Infolinks. Interested? Join Infolinks now. I am looking forward for more cash earnings and investment this year.